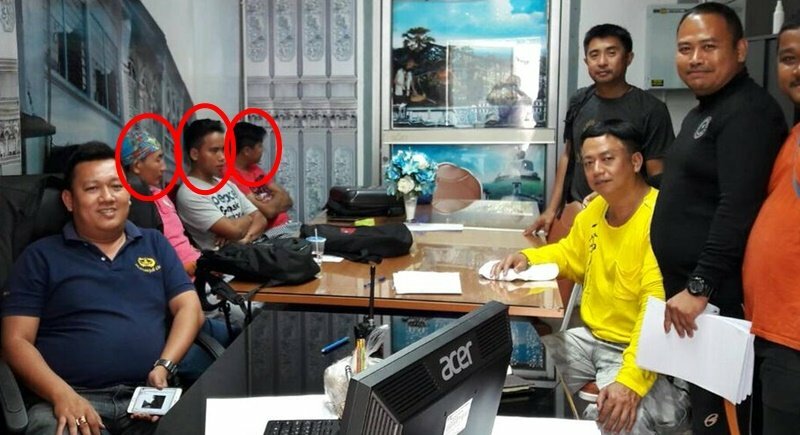 PHUKET: A unit of officials specifically tasked with ridding the island of illegal workers arrested three foreigners found working illegally as tour guides yesterday (Aug 31). The unit, led by Labor office chief, Suthipong Saisakares; deputy chief for Provincial Defence Administration, Mr Jiradet Burarak; Tourism Developer from the office Tourism and Guide Registration Office, Sgt Kittisak Na Rangsi and others officials arrested the three foreign men at the Asia Amari Pier in Rassada at 10am yesterday. The three men, Arleang 30, and Arming, 31, from Myanmar and Mr Sorntong Saelee, 30, of unknown nationality, were arrested while leading a tour group. Mr Jiradet explained “We received an order from Vice Governor Prajiad Aksornthamakul to check this area for illegal workers, and as soon as we arrived at 10am we noticed three men leading Chinese tourists to buy tickets for a tour boat. They were acting as guides for the group. “After monitoring them for a while, we approached them and asked to see their identification cards and work permits,” he said. “Arleang and Arming had ID cards but no work permits, Sorntong had neither,” he added. All three were taken to Phuket City Police Station to face the charges of working illegally as a tour guide and working in Thailand without a permit. Thai Joe12 refuse to see that there is on Phuket not a single possibility that a illegal tour guide can get himself a group of tourists together and 'under mind' the settled thai tourist industry. No way. All these illegal tour guides work for thai companies. Why? Simple, these foreign illegal guides are cheaper. Kurt ... don't need to enquire with anyone but you, as you state, "But I not see the criminal thai employers who did hire illegally the 3 tour guides." You're the one making the bizarre allegation. As Sue Yu2 states, "Kurt:go buy a pair of long socks & do us all a favour" - couldn't have said it better myself. Kurt...have you informed the Police about your amazing discovery? ah, thai Joe12 has a question again. He can call now the relevant thai authorities for answers. By the way:  Mr Somtong Saelee is thai. He is from a hill tribe in north of Thailand. Kurt...how do you know the 3 tour guides were working for someone? If you have that information, let the proper authorities know? As usual, an assumption again to fit in with your bizarre comments. I see a photo with smiling thick belly thai authorities and the 3 accused. But I not see the criminal thai employers who did hire illegally the 3 tour guides. Let me guess, the employers did pay tea money to the 'officials' to get off the hook. I have no other explanation. Do you? Help me out.